6 hours of white madness on snowmobiles through the picturesque areas of Zakopane and the entire Podhale region. Expedition, on the scenic routes of Zakopane. Short trip, but very intense and interesting at the beginning of an adventure with scooters, which will surely be an incentive for the next longer expeditions. Snowmobiles are great fun and unforgettable emotions. You will be able to feel the real taste of winter adventure in the mountains, and these moments will be among the best. The combination of what is in Zakopane in winter is the best - hot thermal pools and snowmobiles. A beautiful day trip, in which you will feel like in a fabulous land. It is a unique expedition, a combination of snowmobiles and thermal pools - an event that not many can afford. Extreme climate, fantastic adventure and pleasure for everyone. Mega professional company. Everything clarified from a to z. I recommend to everyone and look forward to the pictures ???? Join the group of our fans on Facebook and stay up to date! Like our Fan Page on Facebook and stay up to date with news and promotions. 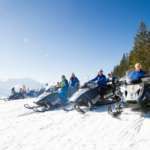 Snow Safari company organizes expeditions on snowmobiles in Zakopane. 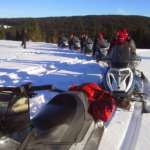 We invite you for winter snowmobile trips, for a fantastic adventure in the mountains. We have a base in the mountains in Zakopane on Gubałówka. Experience a great adventure with us and feel the freedom offered by snowmobiles. Our offer in Zakopane is winter attractions for tourists and winter events for groups. Snow Safari Poland is a snowmobile rental in Zakopane with English-language guides and the best equipment.